You are currently browsing the tag archive for the ‘book reviews’ tag. While all of those things may exist in this book, it contains a fresh edge. The students are taken out of their natural elements and into the woods and we don’t get a good feeling for how privileged they are. They all seem like teens, with their own personalities and quirks. Sib especially, because even though she’s met fame, it hasn’t changed her into a different person. She cares about the world and her friends, even if she does overlook some obvious faults for far too long. She is a real person. Lou’s grief hits you head on. As a biker myself, I can feel the loss of her boyfriend who died in a biking accident. She’s simply putting one foot in front of the other most of the time, but her personality wins through when she sees the atrocious way that Sib’s friend Holly treats others. We get to know her better as her grief gives way to living, and her dry humor and smart replies are priceless. Update: And now that I’ve found this article, I really want to read Six Impossible Things. Hurry up and come out in the US!!! Brian and Rachel set off on bikes across the country, testing their strength and relationship during the thrilling and grueling days in the saddle. Written from Brian’s point of view, he spends a lot of time being apologetic for his white maleness and inspecting his interactions with Rachel. I loved the descriptions of the ride and both the good and bad feelings (physical and emotional) that went with it. However, Brian’s voice got a little whiny at times and I often wished that Rachel was the voice of the story. I’ve been struggling to get through a book. It seems like I only get a few pages in a night and that just doesn’t cut it when you have a pile of books to read. On top of it, it’s a book that a lot of people like and one that I bought, thinking I would like it. That’s right, I actually bought a book. ahem, back to the subject. So, I’ve decided not to finish it. I can still give it to the right teen–someone who likes supernatural mysteries with strong characters and strange plots with a little historical fiction. 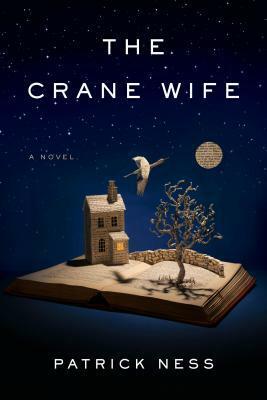 Now I’m reading The Crane Wife by Patrick Ness. It’s the kind of book I can’t wait to get back to. The main character is just a regular guy on the surface, a little amazing below it, who finds himself in a very strange situation. I love the story, the tone and the complex characters and I’m so happy to move on to something that keeps my mind intrigued. The library has been busy. I’m planning a couple of special projects that have been going up and down with triumphs and setbacks. Each time I run up against a setback, another opportunity saves the program. It’s been bumpy but I’m learning a lot and feeling very optimistic how they will turn out. Oh, one more triumph this week. I watched a webinar today given by Eidelweiss and finally scored my first digital ARC. I also figured out how to download it. So I’ll be reading Singapore Noir, a series of short dark stories set in Singapore, a place that’s always intrigued me. And now to go nurse this cold. My third in a month. I hope it’s short.